While the headlines have died down somewhat, large numbers of people are still steadily making their way in dangerous conditions from Syria, Afghanistan, Iraq, Nigeria and other countries, seeking to escape conflict, violence and poverty — and thousands continue to die. Meanwhile, the story also has a complex history going back at least 30 years, shaped in part by conflict in the Middle East, 1980s European border policies, and other factors that too often go unexamined. Determined to give the European migration situation the historical depth, fuller context, and human intimacy it deserves, architect and documentary maker Alison Killing is taking a wholistic approach with migration trail, an online, immersive documentary project that makes innovative use of data, audio, maps and storytelling to more fully contextualize the individual journeys of two fictional migrants. Beginning today, their narratives will unfold in real time to anyone who tunes in. As Killing prepared to launch the project, she told us more. When migration trail launches, you can access it from anywhere to follow the story of two fictional characters each taking a 10-day journey towards Europe. Their stories are told in real time, to convey urgency, as a live instant messaging feed that will appear on the website and in Facebook Messenger. At the start of the story, David, a 30-year-old from Nigeria, has traveled through Niger and Libya to get to the shores of the Mediterranean. His journey unfolds via the Central Mediterranean route from Libya and Italy, then up into France. The second character, Sarah, a 19-year-old Syrian girl from Turkey, travels via Greece towards Germany. Over the course of 10 days, their journeys will be charted in real time on a data visualization map. 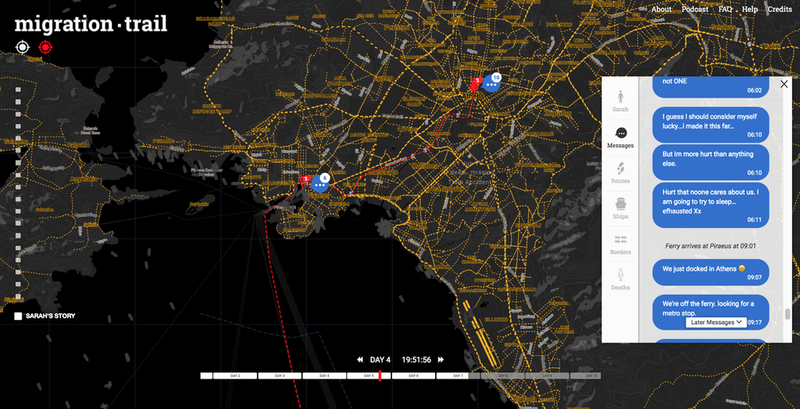 “If, for example, it takes five hours to get across from Rome to Milan in real life, it also takes five hours in the data visualization,” says Killing. Meanwhile, anyone following along can zoom into the data visualization to get more detailed information about each character’s journey. “The more you zoom, the more the data becomes relevant to each character. Personal data might include how far they can continue to travel before their phone battery dies, or where they can get wifi, or how much fuel their boat has,” says Killing. The two characters’ stories are a composite of the stories Killing had gathered during two and a half years of research on migration routes, where she interviewed people and gathered data. What was her starting point for choosing narratives? “When we started to think about the narratives that we wanted to tell, we started with the top ten countries of origin of people travelling to Europe in this way, and then whittled that down, trying to tell a diverse range of stories,” says Killing. “As the stories themselves show, these categories are far from clear cut. There are all sorts of deeper discussions about why people might choose to embark on this sort of journey and why they might choose to leave home for another country, in such a risky way,” says Killing.